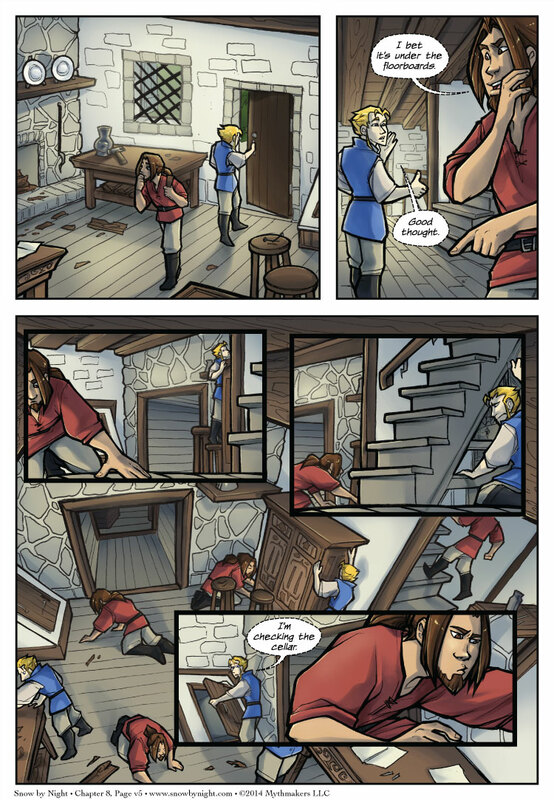 Blaise and Jassart toss Henriette’s house and workshop in Birds of a Feather page 5. Jassart then heads down to the basement. To see what he finds there, please vote for Snow by Night on Top Web Comics. The championship round of the Art Contest ends this Saturday. Two excellent submissions await your consideration. Vote for your favorite. You can vote once a day so if you like them both you can vote for one on one day and the other the next day. Snow by Night will be at AwesomeCon on April 18-20. We’re sharing an endcap with Julie and Amanda of Ianua at Booth 347. I’m hoping to have some new goodies available there. Hopefully, the print run will be done on time.